Bandikoot was founded in the sunny paradise of Byron Bay Australia and is renowned for creating retro-inspired children’s wear, using quality up-cycled vintage fabrics. With a mixture of earthy tones, vibrant prints, clean lines and rich colour palettes, Bandikoot pieces are eclectic, timeless and whimsical. With a strong focus on environmental sustainability and ethical production, we work closely with a family of artisans in Bali Indonesia, to produce small runs of our functional and wearable pieces. Bandikoot is a true grassroots clothing label and is the lovechild of Byron Bay designer, Kate Hemensley. Growing up in bush communes on the North Coast, Kate was taught the value of sustainable living from a very young age. Raised by a caring, crafty and capable single mother, her childhood was unimaginably dreamy and free. Kate’s mum worked as a primary school teacher who pioneered environmental studies. She was a keen activist and took her children to demonstrate anti-nuclear sentiments and deforestation issues – camping on the lawns in front of Parliament House and protesting forest logging in the jungle of the Daintree Rainforest. Kate was instilled with strong environmental ethics and was taught quality over quantity from an early age. Her mum was resourceful, sewing her own clothes and even Kate’s school uniforms, as well as screen printing T-Shirts for Lismore’s Rainforest Information Centre. Learning the skill early, the Bandikoot designer first began hand screen-printing children’s singlets on her kitchen table, and from there her business and creative flow blossomed and evolved. Kate’s evolution to becoming a fashion designer was colourful and unique. Re-locating to Sydney when she was sixteen, she studied photography at the University of Technology and landed a job as a photographer for the social pages of Capital Q Weekly, a local and independent publication for the LGBTI community. Young and free spirited, Kate fell in love with an Austrian skier. Together they bought a Kombi and travelled the whole east coast of Australia – from Hobart to Cooktown. This young love affair would eventually pull her to Europe, where at just eighteen years of age she discovered snowboarding, living in Austria and the US and travelling extensively through Europe, Asia and America. Fearless and driven, Kate coached snowboarding, competed and was published in hard print, before eventually discovering her place in the realm of fashion design. 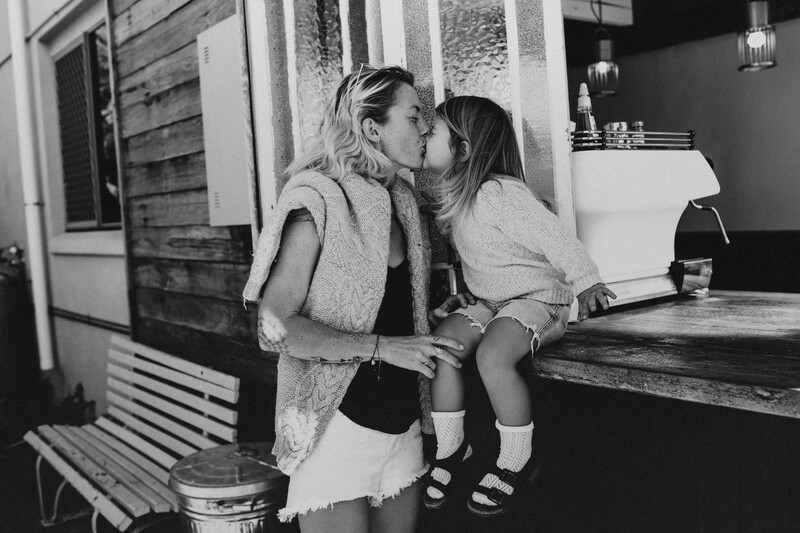 Now living in the serene beauty of the Byron Bay Hinterland with her partner Johnny – Kate juggles the role of small business owner and super star mother – raising her three children, sending her two eldest to Steiner school and prioritising a balanced lifestyle of work and play. Kate continuously finds inspiration in the vibrancy and diversity of the community she lives in, which radiates through her beautiful designs.